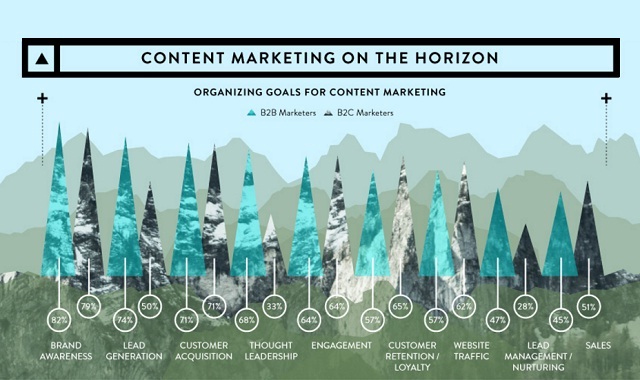 Ascend To New Heights In Content Marketing #infographic ~ Visualistan '+g+"
Marketers know they’re in for a steep hike when trying to attract audiences with content marketing. You can prepare beforehand all you want, but measurement is crucial for reaching your end goals. Without measuring your content’s effectiveness, most marketers today are trekking blindly. Luckily, this doesn’t have to be the case. Check out this infographic to learn everything you need to know about what content marketers are tracking for ROI. We will tell you why companies need content marketing, how marketers are organizing their goals for content marketing, what content is proving to have the best ROI, what metrics marketers are currently tracking, and more!